Amazing isn’t it? Just one swath from a shadow brought Americans together and changed their lives forever. Total eclipses happen regularly, but what makes them so rare is that they rarely occur in specific areas. The last total eclipse in Dallas happened in 1623! Total solar eclipses occur when the New Moon comes between the sun and Earth and casts the darkest part of its shadow, the umbra, on Earth. A full solar eclipse, known as totality, is almost as dark as night. Partial eclipse begins: The moon starts becoming visible over the Sun’s disk. The Sun looks as if a bite has been taken from it. Total eclipse begins: The entire disk of the sun is covered by the moon. 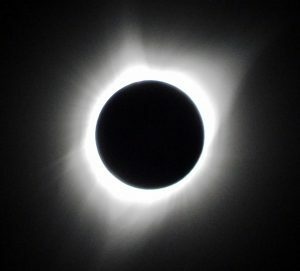 Observers in the path of the moon’s umbra may be able to see Baily’s beads and the diamond ring effect, just before totality. Totality and maximum eclipse: The moon completely covers the disk of the sun. Only the sun’s corona is visible. This is the most dramatic stage of a total solar eclipse. At this time, the sky goes dark, temperatures can fall, and birds and animals often go quiet. The midpoint of time of totality is known as the maximum point of the eclipse. Observers in the path of the moon’s umbra may be able to see Baily’s beads and the diamond ring effect, just after totality ends. Total eclipse ends: The moon starts moving away, and the Sun reappears. Partial eclipse ends: The moon stops overlapping the Sun’s disk. The eclipse ends at this stage in this location.